Hot Summer here in Hong Kong, thinking to cook something refreshing for our Sunday dinner. 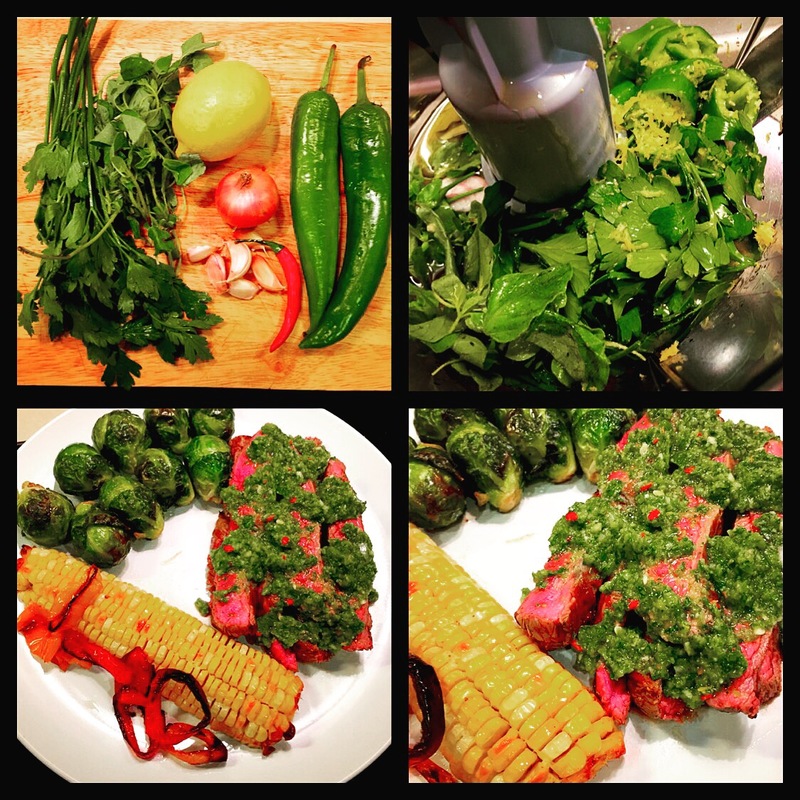 A refreshing green sauce, chimichurri could be a nice idea, to go with the flank steak, and served with some grilled vegetables instead of salad. Well, actually chimichurri sauce is something that we can cook in advance, it’s fine to make more than what you need and the trick is to chill them in the fringe. Use it when you need it for the steak and actually it is also nice to use as dips for your bread. Make sure you have some chimichurri made few hours or days before you use them, put them in a glass bottle in the fringe. How to make the chimichurri sauce is pretty simple, just put all the ingredients in the food processor to finely chop and blend them. The ingredients are, parsley, oregano, garlic, shallot, green chili or jalapenos, red chili, lemon zest but this could be an option, good amount of olive oil around 100ml, red wine vinegar or white vinegar and a pinch of salt, please adjust the amount of chili or jalapenos, it all depends on the level of spiciness that you can take. When the sauce is well blended, leave it in the fringe for a good couple of hours at least, before serving. On the other hand, you can prepare the vegetable. I was cooking with some brussels sprouts, corn and some mini peppers. Cut the corn in half, slice the mini pepper and remove the seeds, place them in a tray and brush them with some melted butter, or add some olive oil to make sure there is enough oil there to grill them. Season them with a bit of salt and pepper, then place them in the oven under 190C to grill for around 25 mins. I cooked the brussels sprouts with butter in a saucepan, just fry them until they are soft and cooked, season them with some salt and pepper as well. For the flank steak, season them with salt and pepper before cooking. Make sure the steak is defrost and with room temperature before cooking, in order to avoid having raw and cold meat in the middle of the steak. Make sure the pan is really hot and fry both side for 2 to 3 minutes on each side, and let the meat stay medium cooked. Do not cut the meat right away, try to let the juice sit inside for few minutes, then cut the steak against the grain in order to keep it tender, in that way the steak should be less chewy. Serve the cut flank steak with some chimichurri sauce on top, and some grilled vegetable aside. I really feel to have pork ribs tonight, I don’t know why, but really craving for pork ribs. Weather is super cold today, 4C is really cold in a place like Hong Kong. It’s good to have something grill and maybe with mashed potatoes as well. Let’s go for grocery shopping! So, go and get everything I need for this dish, olive oil and butter, just run out of them. Ginger, garlic, potatoes and string beans, for the rest of the ingredients, I have them at home. The most important thing is pork ribs, I don’t know what happened, but 2 stores both sold out of pork ribs. Maybe because weather is too cold, everyone prefer to stay home for dinner, and also think of cooking pork ribs? Luckily, I got them in another super market, but they are not the kind of pork ribs I am looking for, they are too small and lean. I am looking for the big piece, with a bit of fat mixed with lean meat. But it’s still OK, better than nothing. First of all, boil a pot of hot water and put the potatoes into the pot and boil them. The trick is, to slightly cut a cross mark on the potato skin, so you will get the skin out easier when you peel them. On the other hand, get the pork ribs prepared and season them with salt and pepper. Use a tray or pan to cook the pork rib which can transfer that directly to the oven later on. Heat the tray or pan with olive oil, fry the pork ribs on both sides until they turned golden brown. Put the chopped onion, ginger slides and garlic into the tray, fry them a bit. Then, put dry pepper flakes, some pink peppercorns, and some star anise in it. Now, it’s time to put a good amount of honey, followed by soy sauce, vinegar, lemon juice and some rice wine. Give a good stir, and then finally add some pork bone broth. Here I would like to use pork bone broth than chicken broth, as I think the taste should go better together since this is a pork dish. Place the tray or pan into the oven and grill it under 180C for 25 to 30 minutes, and then flip the ribs and grill for another 25 to 30 minutes. While waiting for the ribs to grill, we can work on the mashed potatoes. By this time, the potatoes should be ready, if you are not sure, use a chopstick or something like that to see if you can get it all the way down to the entire potato easily. If you can, that means it’s done. If not, or even if you can but seems hard, that means you need to boil it longer. Peel all the potato skin, and place the potatoes into a large bowl. Cut them into small pieces, or you can use one of those potato mashing tool. I only use a fork to do it, which is simple and easy, as long as your potatoes are fully cooked, then should not be a problem. Cut few slides of butter into the potatoes, and season them with some salt and pepper, and I like to add some ground paprika as well. Then you can start to smash them and mix them, until they look like a good mashed potatoes. Actually, this is my own way to make the mashed potatoes, as there are many other ways, with milk or with cream. But I kind of like it without, just find the right type of potatoes and they will do the work even without adding cream or milk, I just feel adding butter is good enough. Now we need to prepare the string beans, heat the pan with butter, then fry the string beans and season them with salt and pepper until they are done.